In 2002, Jonathan Cooper, a well-respected violin maker from Maine, had a wonderful idea for honoring Daniel Pearl, the violinist, fiddler and Wall Street Journal reporter who was murdered in Pakistan earlier that year. To continue Daniel’s legacy through a musical mission of peace, Jon crafted a work of art, the Daniel Pearl Memorial Violin. As one of Daniel’s musical mentors, Mark O’Connor was invited by the family and friends of Daniel Pearl to perform at his memorial service in Boston, November, 2002. Jon contacted Mark to help him present the beautiful violin to the Pearl family at this memorial for Daniel. 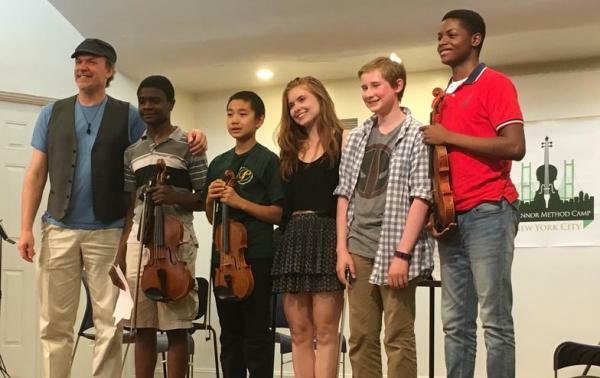 One year later, the Pearl family gifted the violin to Mark and his string camps in order for deserving students to have the opportunity to practice and perform on such a valuable instrument with the monetary value of $20,000 to $30,000. A tradition was established at O’Connor String Camps, that the violin in Daniel’s name, would rotate through the student body in perpetuity. From that initial inspiration, and through the help of more private commissions, the array of Daniel Pearl Memorial Instruments grew, eventually becoming a quartet of uniquely beautiful stringed instruments dedicated to Danny’s memory. Two violins crafted by Cooper, as well as a cello and a viola, are now presented each year to promising young musicians by Mark O’Connor. 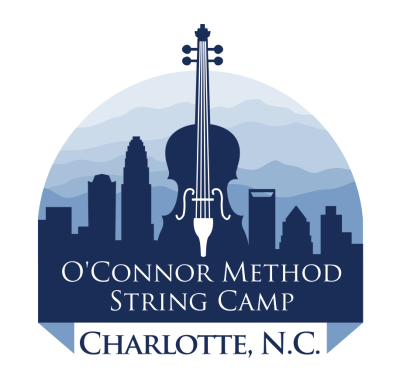 At the O’Connor Method String Camp, exceptional string students are awarded the honor to play these instruments for a year, and are also given a scholarship to return to camp the next year and continue the tradition. "By passing the instruments through so many hands and playing past musical borders, we hope that the beautiful sound of these violins will help inspire listeners to live in harmony, on a peaceful planet.” –Jon Cooper. 2017 recipients Croft Stone, Jodie Stone, and Hannah Klinghoffer! These deserving students will play these beautiful instruments for a year and attend to the Charlotte, N.C. Camp to continue the tradition, performing Mr. O'Connor's "Appalachia Waltz" for the ceremony at the Student Electives Concert! They are pictured here with the 2016 recipients Angelo Chery, Joshua Wang, and Jafre Chase, along with Mark O'Connor at the previous camp in New York City. Hannah Klinghoffer is 15 years old and from Seattle, Washington. She started playing violin at the age of 8, playing strictly classical music. It wasn’t until she began studying under Ben Hunter that she was introduced to the fiddle side of the violin. With Mr. Hunter, Hannah performed in the Northwest Folklife Festival for the first time when she was 9 years old, and fell in love with that style of music. She has come back each year to perform in the festival. Hannah also plays in the symphony at her school, Ingraham High School, under the direction of Heidi Oveson. 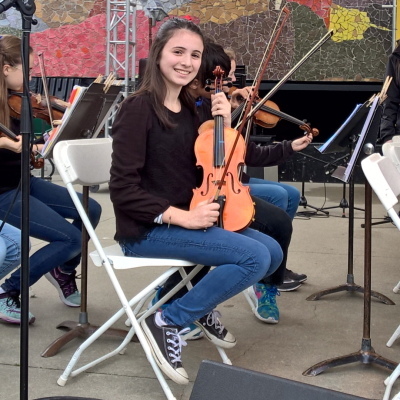 In 2015, Hannah had the opportunity to join the youth orchestra at the Wintergrass music festival. During the festival, the students in the orchestra played with many artists, including Mark and Maggie O’Connor. Hannah found out about the O’Connor method camp in NYC and after listening to Mark and Maggie O’Connor perform, she knew that she wanted to play more of that genre of music. Croft (Didi) Stone is currently a 6th Grade student at Rising Starr Middle School in Fayetteville, GA and is 12 years old. He began playing the violin at the age of 5 and the viola at age 8. Throughout his years of learning the violin, he has been performing with the Fayette County Fiddlers in multiple local events and concerts. He has also been the principal violist of a community orchestra, Fortissimo String Orchestra and a member of a youth quartet, "Quartet le Petit" along with his sister, Jodie Stone. Didi has participated in different music camps over the years. The O'Connor music camp has always been his favorite. The fellowship, rigor, and fun of the camp, including the inspiring musicians, have helped him grow as a violinist and violist over the past few years. Winning the Daniel Pearl Viola has been an amazing validation to his hard work and dedication to his violin and viola playing. Since winning the Daniel Pearl Viola , Didi has become the principal violist at his middle school, performed with the All County Orchestra as a violinist, and performed with the Emory Junior Chamber Orchestra as a violist. He will also be performing as a violist with the Georgia All State Orchestra in March, 2018. Jodie Stone is currently an 8th Grade student at Rising Starr Middle School in Fayetteville, GA and is 13 years old. She began playing the violin at the age of 5 and the viola at age 10. Along with her brother, Didi Stone, she has been performing with the Fayette County Fiddlers in multiple local events and concerts. She has also been the principal violinist of a community orchestra, Fortissimo String Orchestra and a member of a youth quartet, "Quartet le Petit" along with her brother, Didi Stone. The first year of participating in the O'Connor music camp was one of the biggest turning points of Jodie's musical experience. She could not stop talking about how much it has helped her realize she loves playing the violin. She looked forward to listening to, learning, playing, and performing alongside world class teachers and musicians during the camp. Winning the Daniel Pearl Violin raised this experience of awe with the camp even higher than she could imagine. Since then, Jodie has become the principal violinist of her middle school orchestra, auditioned into the Emory Junior Chamber Orchestra (currently the principal 2nd violin), and performed with the All County Orchestra. 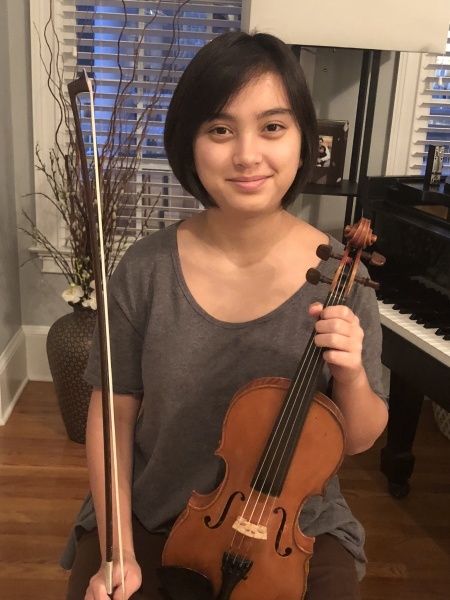 She will also be performing with the Georgia All State Orchestra in March 2018. We are thrilled to share with you that we will be awarding the Daniel Pearl Memorial Cello at the 2018 camp! This gorgeous instrument has been with the maker Jon Cooper, but is now ready for the next lucky student at the 2018 camp. 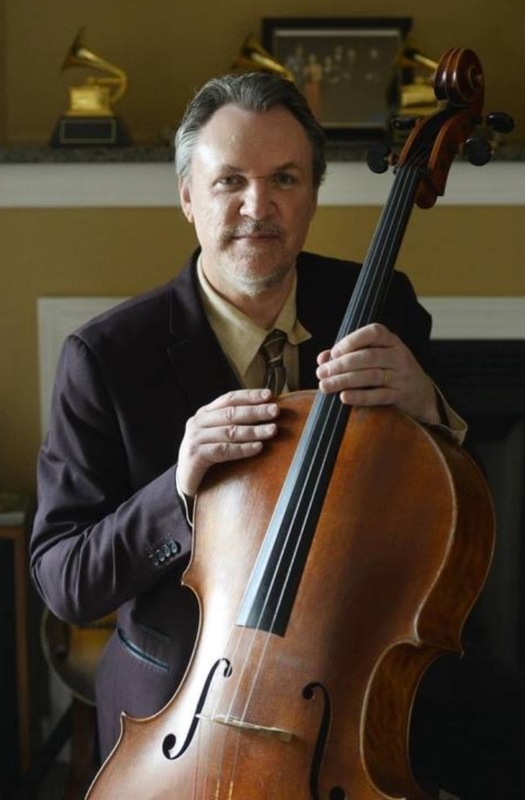 Here is a photo of Mark O'Connor with the cello from a feature article in the Charlotte Observer. 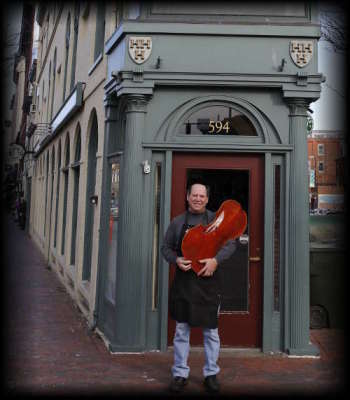 This cello was made in 2010, read more about previous cello recipients here .